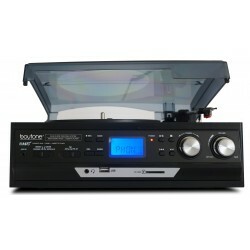 BOYTONE MULTI RPM TURNTABLE� BLACK� TTBT17DJBBK 33/45/78 RPM AM/FM Radio with Stereo FM Cassette Player 2 Built-in Stereo Speakers MP3 & WMA Playback USB/SD Support Encode/Convert Vinyl Records to MP3 Encode/Convert Radio to MP3 Encode/Convert Aux In to MP3 (such as Pandora, YouTube, etc. from your phone or tablet) Remote Control . 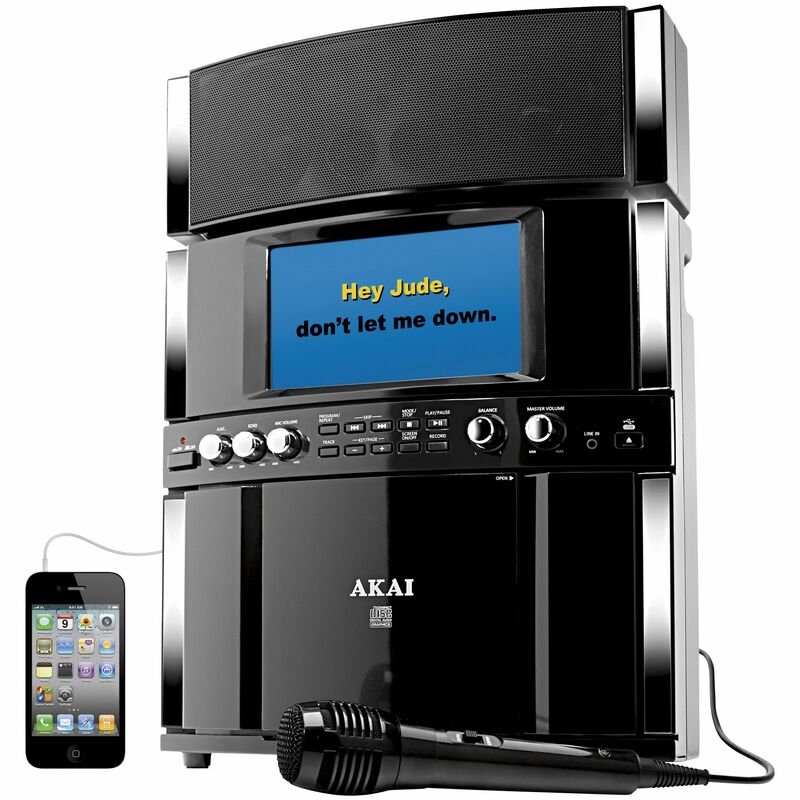 AKAI PROFESSIONAL KARAOKE SYSTEM� WITH BLUETOOTH� KKAKS800� Features:Front�load CD+G mechanism7″ Color TFTEcho controlA. (Auto Voice Control)Balance controlDigital key controlMaster volume controlMicrophone volume controlUSB port for MP3/MP3G record & playbackLine-in functionBuilt-in speakersTwo microphone jacksVideo output for TV connectionAudio outputTwo microphone holdersCompatible to CD/CDG/CDR/MP3/MP3GOutput Power:2 X 5W (RMS)Power Source:AC Power AdaptorIncluded:1 cradle1 microphone1 RCA cord1 line-in cord1 demo CD+G disc1 AC power adaptor. 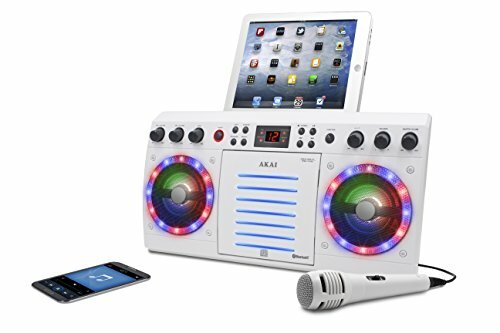 AKAI CD&G KARAOKE SYSTEM� WITH BLUETOOTH� WHITE� KKAK303WH Bluetooth with Front Loading CD&G Player Features Line-In Jack, Two Microphone Jacks and A/V Outputs to TV Also Features Auto Voice Control, Echo and Balance Controls Multi Color Light Effect & iPad/Tablet Cradle Included Operates on included AC Adapter � � � � � � � . 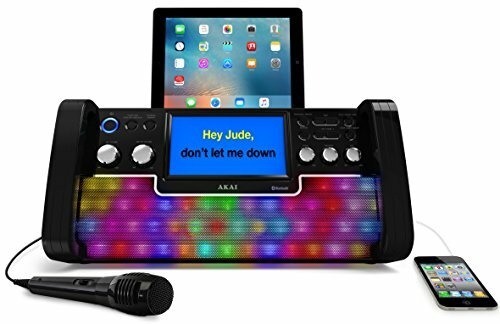 AKAI CD&G KARAOKE SYSTEM� WITH BLUETOOTH� BLACK �KKAK780BK Bluetooth with Top Load CD&G Player 7" Color Display with USB for MP3&G Playback/Record Features Auto Voice Control, Echo and Balance Controls and Digital Key Control Multi Color Light Effect & iPad/Tablet Cradle Included Includes Microphone, A/V Cord, Line-In Cord, Demo CD&G . 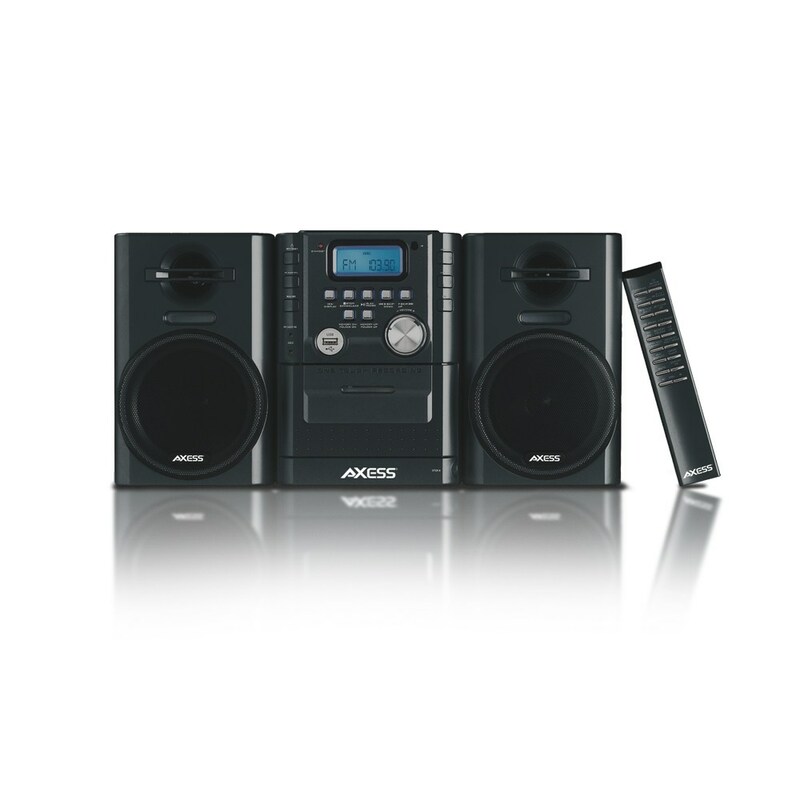 JENSEN BLUETOOTH CD MUSIC SYSTEM� HSJS200 • Supports A2DP, AVRCP, GAVDP, GAP� • NFC for Easy Pairing� • Stream Music from Another Compatible Bluetooth Device� • Auxiliary Input Jack on Front for Connecting Your iPod or other Digital Audio Players� • Top Loading CD Player� • CD-R/RW Compatible� • Multi Function Blue LCD Display with Dimmer Control� • Clock with Sleep Timer� • AM/FM Stereo Receiver with 20 Presets and PLL Digital Tuning� • Stereo Speakers� . 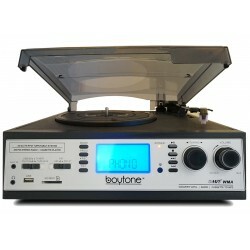 BOYTONE MULTI RPM TURNTABLE� BLACK� TTBT19DJBCBK 33/45/78 RPM AM/FM Radio with Stereo FM Cassette Player 2 Built-in Stereo Speakers MP3 & WMA Playback USB/SD Support Encode/Convert Vinyl Records & Cassette Tape to MP3 Encode/Convert Radio to MP3 Encode/Convert Aux In to MP3 (such as Pandora, YouTube, etc. 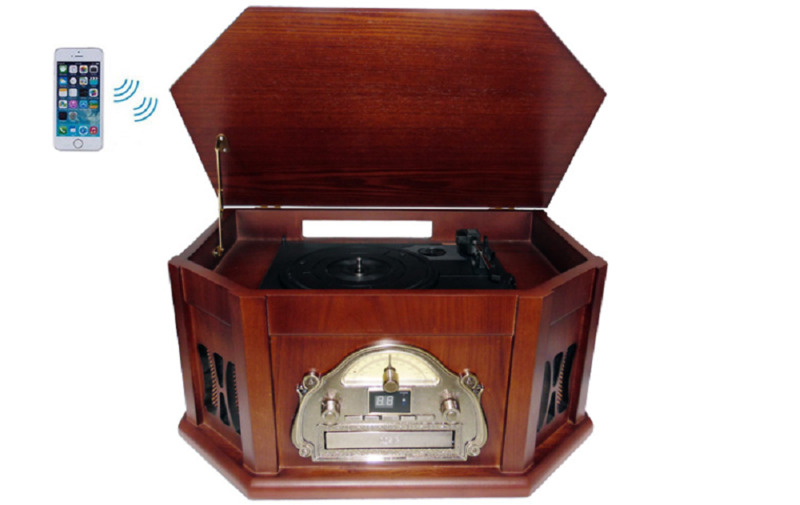 JENSEN 3-SPEED STEREO TURNTABLE WITH BUILT-IN SPEAKERS AND SPEED ADJUSTMENT Bluetooth 2. 1 with EDR - Supports A2DP, AVRCP Bluetooth Range Up to 33’ NFC for Easy Pairing Auxiliary Input Jack for Connecting Your iPod, MP3 or other Digital Audio Players Vertical Loading CD Player Skip/search, Forward/backward, Repeat One/All and Random Play Programmable Memory CD-R/RW Compatible Multi-function Blue Backlit LCD Display including Clock FM Stereo Receiver with 20 Presets and PLL Digital Tuning 4 Stage EQ (Rock, Jazz, Pop, Classic) X-Bass for Extra Bass Boost 1 Amp USB Port for Charging your iPod, iPhone or Android Smartphone Clock Wake to Radio or CD Wall Mount Kit Included Detachable Stand Remote Control Output: 2 x 3W RMS Power: AC 120V/60Hz Remote Control: 1 x CR2025 Lithium Battery (Included) � . 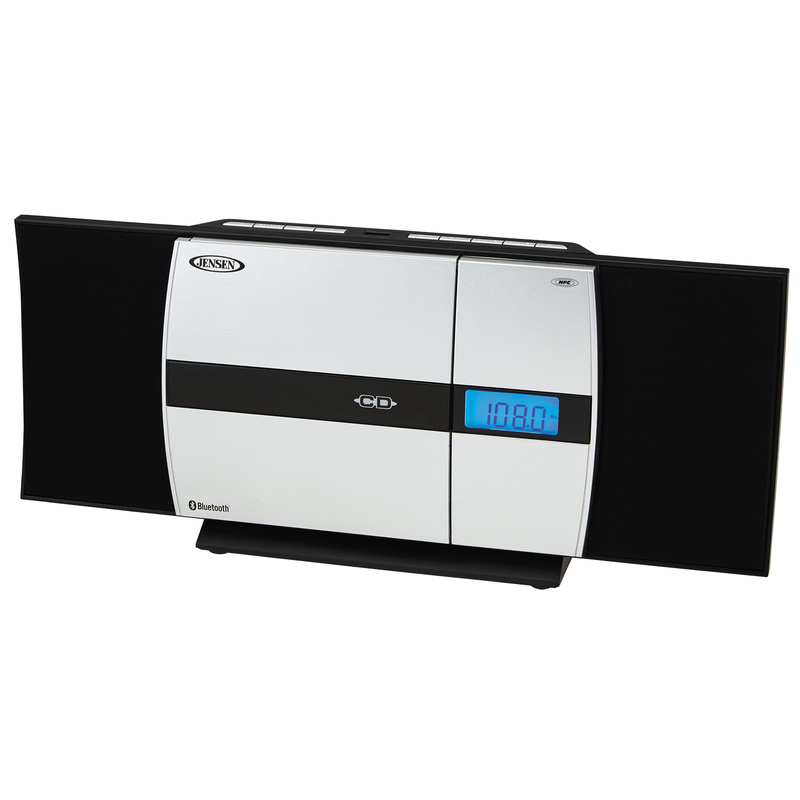 BOYTONE �7-in-1 Multimedia System with Built-in Speakers & Bluetooth Connection to Larger Bluetooth Speakers TTBT37MC ��������� 33/45/78 RPM ��������� AM/FM Radio with Stereo FM ��������� Bluetooth 4. 1 Connectivity to Bluetooth Sound Audibles ��������� Cassette Tape Player ��������� 2 Built-in Stereo Speakers ��������� MP3 & WMA Playback ��������� USB/SD Support ��������� Encode/Convert Vinyl Records & Cassette Tape to MP3 ��������� Encode/Convert Radio to MP3 ��������� Encode/Convert Aux In to MP3 (such as Pandora, YouTube, etc. from your phone or tablet) . BOYTONE MULTI RPM TURNTABLE� BROWN� TTBT19DJMCBN 33/45/78 RPM AM/FM Radio with Stereo FM Cassette Player 2 Built-in Stereo Speakers MP3 & WMA Playback USB/SD Support Encode/Convert Vinyl Records & Cassette Tape to MP3 Encode/Convert Radio to MP3 Encode/Convert Aux In to MP3 (such as Pandora, YouTube, etc. 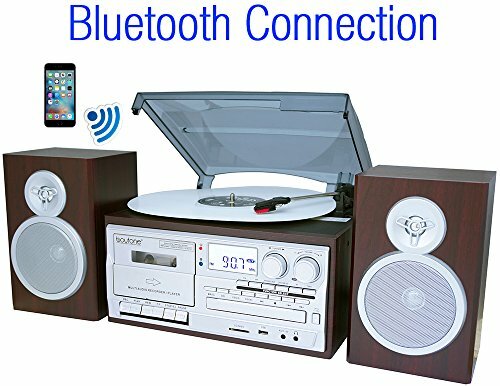 BOYTONE 8 IN 1� CLASSIC�AUDIO SYSTEM TURNTABLE� MAHOGANY� TTBT25MB 8 in 1 Bluetooth turntable 33 1/3, 45 & 78 RPM speed /CD Player/USB records/SD/Cassette AM/FM Radio - Ceramic stereo cartridge - 2 built in speaker speakers Fully automatic belt-driven turntable spins 7, 10 or 12-inch records at 3 speeds of 33 1/3, 45 & 78 RPM so you can enjoy your record and music Front loading, single CD, Drawer type - Auto return - Remote control for CD/USB, with natural wood Classic vintage look. Built in high power speakers great for enjoying your music Product is backed with 1 year direct Boytone USA warranty. Fast shipping from USA . 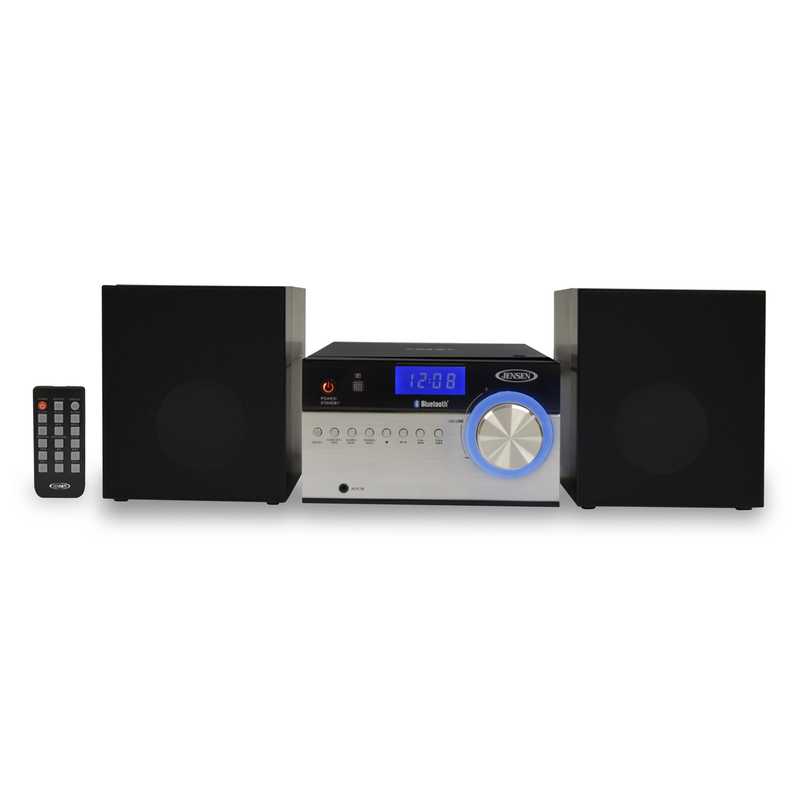 BOYTONE �7-in-1 Multimedia System with Built-in Speakers & Bluetooth Connection to Larger Bluetooth Speakers� TTBT37WTC ��������� �33/45/78 RPM ��������� AM/FM Radio with Stereo FM ��������� Cassette Tape Player ��������� 2 Built-in Stereo Speakers ��������� MP3 & WMA Playback ��������� USB/SD Support ��������� Encode/Convert Vinyl Records & Cassette Tape to MP3 ��������� Encode/Convert Radio to MP3 ��������� Encode/Convert Aux In to MP3 (such as Pandora, YouTube, etc. from your phone or tablet) ��������� Remote Control . BOYTONE 8 IN 1� CLASSIC STYLE TURNTABLE� BLACK� TTBT28SBK Boytone BT-28SPB Classic style with modern technology - Bluetooth wireless music streaming turntable with 2 separate stereo speakers. 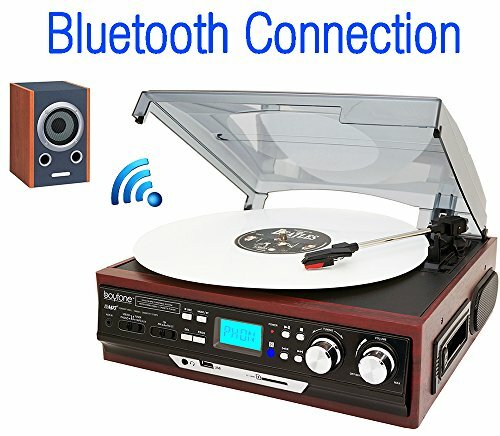 Record from Vinyl, Radio, and Cassette to MP3, SD slot, USB, AUX. Works with virtually any Bluetooth enabled device - (iPhone, Android, Smartphone, iPad, Tablet, PC) front load CD and Cassette easy to access. 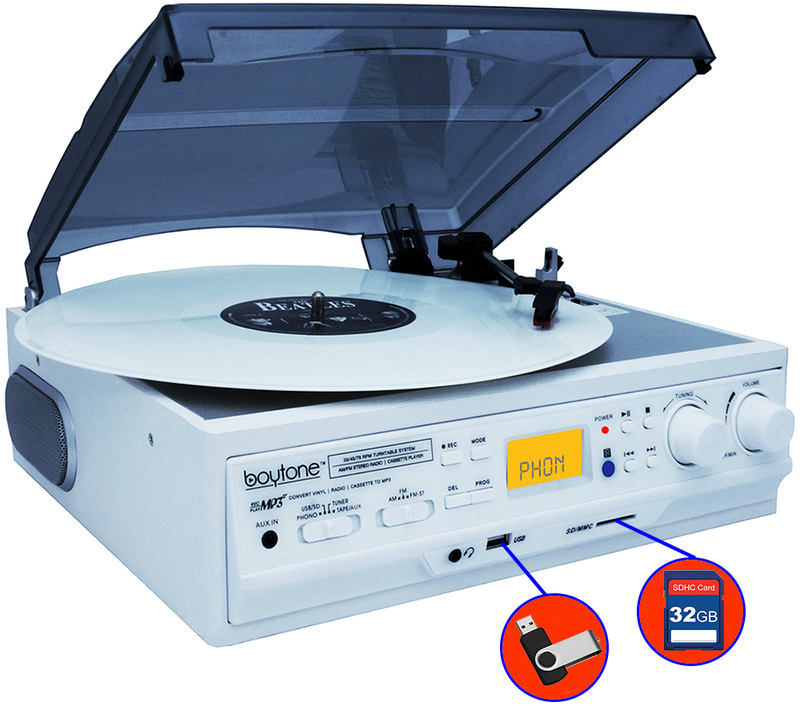 Ability to convert vinyl records, Cassette, Radio into MP3 files - Save your music onto USB flash or SD memory cards. Large Display Screen CD player, Cassette recorder and Player, SD, USB, headphone jack, RCA line out, AUX input MP3 CD and CD-R/RW Compatible, Skip/Search Forward and Back, Repeat 1/Single Disc, Convert vinyl to MP3 format without a computer Random Play, Programmable Memory, Multi-function Back-lit LCD Display, Direct USB/SD recording from Turntable / Cassette / CD / AUX IN / AM/FM Radio. 1 year warranty from Boytone USA . BOYTONE 8 IN 1� CLASSIC STYLE TURNTABLE� SILVER AND MAHOGANY TTBT28SLMO Boytone BT-28SPS Classic style with modern technology - Bluetooth wireless music streaming turntable with 2 separate stereo speakers. Convert vinyl to MP3 format without a computer. 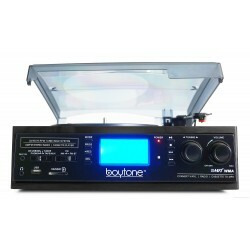 BOYTONE MULTI RPM TURNTABLE� BLACK� TTBT14TBK 33/45/78 RPM AM/FM Radio with Stereo FM Cassette Player 2 Built-in Stereo Speakers MP3 & WMA Playback USB/SD Support Encode/Convert Vinyl Records to MP3 Encode/Convert Radio to MP3 Encode/Convert Cassette Tape to MP3 Encode/Convert Aux In to MP3 (such as Pandora, YouTube,etc. 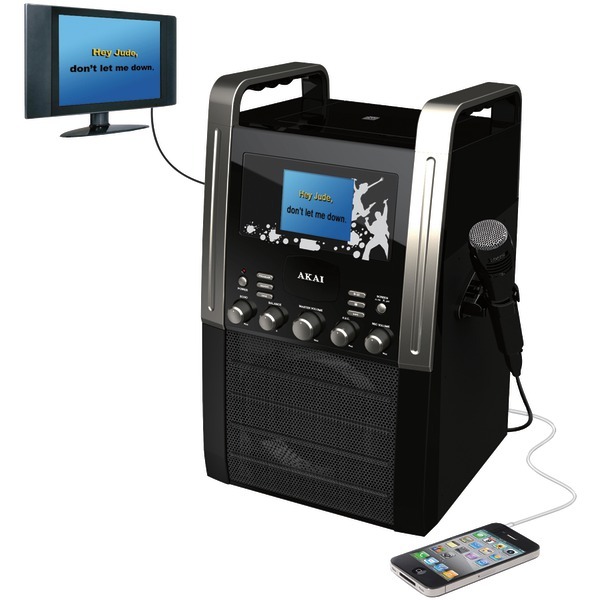 AKAI CD+G KARAOKE MACHINE� KKAK515 CD+G karaoke machine with built-in speaker & 3. (Auto Voice Control)Balance controlMaster volume controlMicrophone volume controlLine-in functionBuilt-in speakerTwo microphone jacksVideo output for TV connectionAudio outputCompatible to CD/CDG/CDROutput Power:1 X 5W (RMS)Power Source:AC Power AdaptorIncluded:1 microphone1 RCA cord1 demo CD+G disc1 AC power adaptor. BOYTONE � MOBILE SUITCASE�TURNTABLE� � RED � TTBT101NRD � � 3 Speed Portable Briefcase�Turntable with built in speakers with SD/AUX/USB/RCA/3. 5mm connectivity to encode Vinyl, Radio & Auxiliary to MP3 and enjoy MP3 or WMA playback on USB or SD. 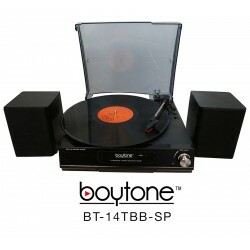 BOYTONE 7 IN 1 3 SPEED TURNTABLE� WITH BUILT IN SPEAKERS� BLACK� TTBT27RBK Boytone BT-27R-C Bluetooth connection with 3 Speed (33/45/78 RPM) 3. 5mm Headphone Jack (Color Black & Rose Gold) Built in 2 stereo Speakers - Digital Read out AM/FM Radio- (Power Source: AC 110V (UL) MP3 & WMA Playback Cassette Player - Rotary Knobs - Dust cover Direct USB/SD/AUX Encoding For Turntable, Cassette and Auxiliary Product is backed with 1 Year direct Boytone USA warranty Ships fast from USA. 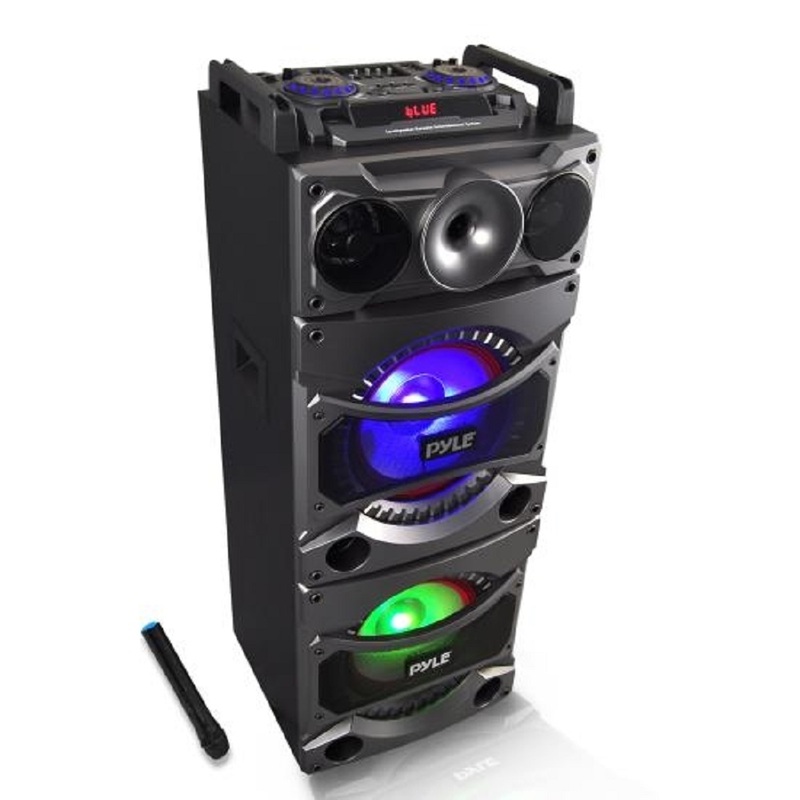 PYLE Bluetooth PA Loudspeaker Karaoke Entertainment System, Active Powered Speaker, Flashing DJ Party Lights, MP3/USB/SD, FM Radio, Wireless Mic� KKPY1038 Features: PA Loudspeaker Karaoke Entertainment System High-Powered Active Speaker Tower Multi-Colored DJ Flashing LED Lights Pulse to the Music Bluetooth Wireless Music Streaming USB Flash & SD Memory Card Readers Includes Wireless Handheld Microphone Digital LCD Display with FM Radio Top Panel Audio Control Center (2) 1/4'' Microphone Inputs RCA (L/R) Aux Input Connect & Stream Audio from External Devices Convenient Carry Handles & Rolling Wheels Treble, Bass, Echo, Volume Controls DJ Party Lights ON/OFF Switch Bluetooth Wireless Streaming: Instantly Stream Music from Your Bluetooth Devices Works with All Your Favorite Bluetooth Devices (iPhone, Android, Smartphone, iPad, Tablet, PC, etc. 1 Bluetooth Wireless Range: 50'+ Feet Bluetooth Network Name: 'Pyle Audio' What's in the Box: Active Speaker Tower Wireless Microphone Power & Audio Connection Cables Detachable Rolling Wheels Remote Control . PYLE Bluetooth PA Loudspeaker Karaoke Entertainment System, Active Powered Speaker, Flashing DJ Party Lights, MP3/USB/SD, FM Radio, Wireless Mic� KKPY1043 Features: All-in-One Karaoke Entertainment System High-Powered Active Speaker Tower Multi-Colored DJ Flashing LED Lights Bluetooth Wireless Music Streaming USB Flash & SD Memory Card Readers Digital Audio File Support Includes Wireless Handheld Microphone FM Radio with Auto Station Scan (2) 1/4'' Microphone Inputs RCA (L/R) & Aux (3. 5mm) Inputs Connect & Stream Audio from External Devices Convenient Carry Handles & Detachable Rolling Wheels Treble, Bass, Echo, Volume Controls DJ Party Lights ON/OFF Switch Bluetooth Wireless Streaming: Instantly Stream Music from Your Bluetooth Devices Works with All Your Favorite Bluetooth Devices (iPhone, Android, Smartphone, iPad, Tablet, PC, etc. 1 Bluetooth Wireless Range: 50'+ Feet Bluetooth Network Name: 'Pyle Audio' What's in the Box: Active Speaker Tower Wireless Microphone Power & RCA Audio Cables Detachable Rolling Wheels . 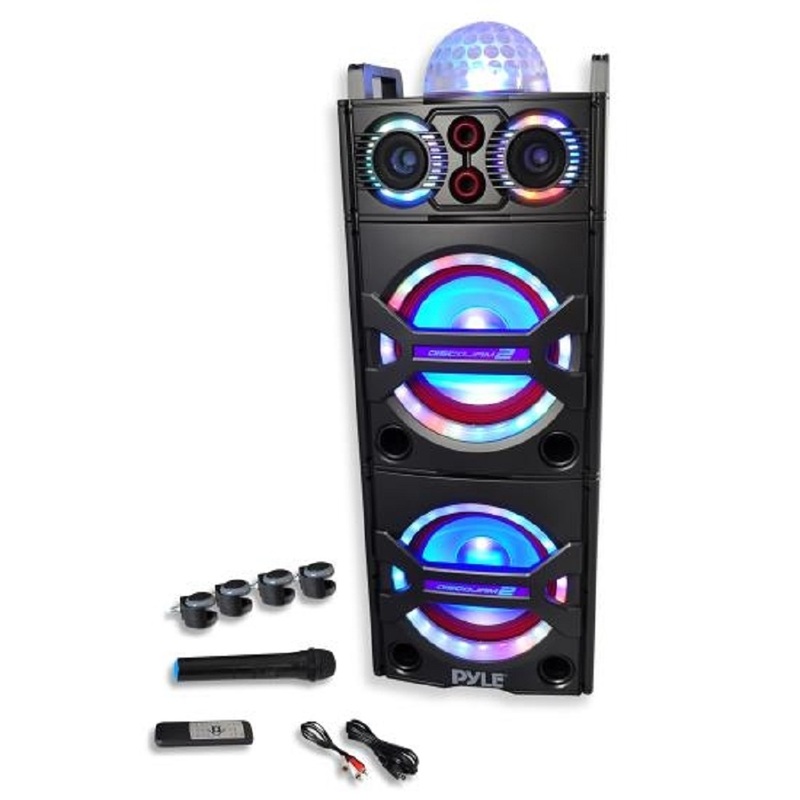 PYLE Bluetooth PA Loudspeaker Karaoke Entertainment System, Active Powered Speaker, Flashing DJ Party Lights, MP3/USB/SD, FM Radio, Wireless Mic� KKPY1238BT Features: PA Loudspeaker Karaoke Entertainment System High-Powered Active Speaker Tower Multi-Colored DJ Flashing LED Lights Pulse to the Music Bluetooth Wireless Music Streaming USB Flash & SD Memory Card Readers Includes Wireless Handheld Microphone Digital LCD Display with FM Radio Top Panel Audio Control Center (2) 1/4'' Microphone Inputs RCA (L/R) Aux Input Connect & Stream Audio from External Devices Convenient Carry Handles & Rolling Wheels 5-Band Master Audio EQ Configuration Treble, Bass, Echo, Volume Controls DJ Party Lights ON/OFF Switch Bluetooth Wireless Streaming: Instantly Stream Music from Your Bluetooth Devices Works with All Your Favorite Bluetooth Devices (iPhone, Android, Smartphone, iPad, Tablet, PC, etc.